Measuring 6x5x7 inches (14x13x18cm), our Deluxe Human brain model is an autographed anatomical model that has 115 features, including the twelve cranial nerves that are numbered on the model and are identified in its accompany key. These cranial nerves and brain stem are both dissectible and in addition to that, the right hemisphere of this brain model can be divided into two sections while on the other hand the left half of this brain model can be divided into four segments which includes both half of the brain stem and half of the cerebellum. 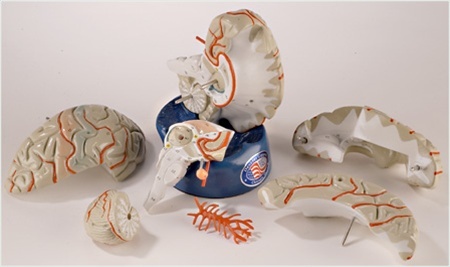 This human brain model incorporates the arterial blood supply with complete termini carotids, basilar artery, and Circle of Willis. Aside from that, the pituitary and the basilar artery are both detachable; Allowing you a hands-on and closer study of a human brain structure. For added feature, this deluxe brain model also includes a reproducible illustrated copy masters allowing you to print illustrated study/quiz sheets. Just take note that the answer keys are printed on the reverse. When it comes to toughness of this model, it is very safe to pass around since this brain model is cast on a non-breakable vinyl plastic that is known for durability and versatility. All the detachable components of this human brain model are secured with pins so you can rest assure that the brain will not come apart unless you pull it apart. And the most important thing about it, is that this human brain model is one of the autographed anatomical models that are personally autographed and dated by its crafter. This autographed anatomical model carries a life time warranty that guarantee you a FREE of charge replacement or repair as long as it is proved that the model that owned has a factory defect. This is 100% American made and we can assure you that every step of its production starting from model molding, hand sanding, hand painting and numbering are all done in the US! 100% AMERICAN MADE- These giant regional brain models are 100% American made because every step of its production, starting from model molding, hand sanding, hand painting, number are all done in America. SATISFACTION GUARANTEE- If it is proved that the model that bought has factory defect, we can guarantee you can rest assure that we will definitely replace or repair it. This is FREE of charge as long as you own the model. DURABLE- You can guarantee that this giant brain model is very sturdy even if you pass it around. It is made and molded of a non-breakable vinyl and each of its detachable segments are secured with pins. NESTED ON A SPECIAL DISPLAY BASE-This Giant Regional Brain Model is nested on a special display base for a closer and broader observation of the brains superior, inferior and lateral aspects. And also, for a perfect display when it is not in use. MEASUREMENT- Measuring 6x5x7 inches (14x13x18cm), this giant brain model is twice of a life-size brain. Perfect for presentation to a larger group. FUNCTIONAL- This deluxe brain model is very functional given that the cranial nerves and brain stem are dissectible and in addition to that; The right hemisphere of this brain model is can be divided into two while the left half is can be torn apart into four segments which includes both half of the brain stem and half of the cerebellum. And also, the pituitary and the basilar artery are both detachable. Allowing you a hands-on and closer study.